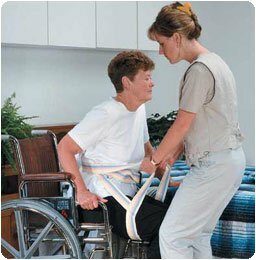 The Transfer Sling and Gait Belt combines both a transfer belt with a sling for the support and aid needed when transferring an individual or patient. The sling and gait belt support behind the back and under the knees to form a sling. This sling is most appropriate for sit-pivot transfers. Designed to be used as one or two person lift. Supports up to 500 lbs.